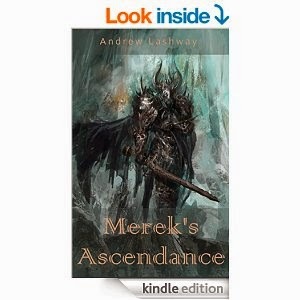 Merek's Ascendance by Andrew Lashway. Merek has spent his entire life breaking his back on his parents' farm. They're angry, ignorant, and abusive, and one day Merek realizes that if he doesn't escape he'll be trapped forever. He has to escape, but that's easier said than done. And once he's on his own, he'll face bigger challenges than he ever could have imagined. But more dangerous still is the local weather, characterized by sudden intense storms, flying rocks, and floods. Merek's skills are pushed to the limit when he stumbles across Thorald, the crown prince of Wentana, badly injured and in possession of sensitive diplomatic information. Merek finds himself en route to the capital city, where he is caught up in a whirlwind of political conflict, treachery, training, intrigue, and romance. Countless adventures await... and his ability to adapt (and survive) will be pushed to the limit. I was in the mood for something a bit more conventional and Merek's Ascendance caught my eye. The novel follows Merek a 17yr old teenager who lives a wretched life on a farm with parents that physically and mentally torment him. After having had enough he finally musters enough courage to run away once and for all. The story then unfolds as an illiterate farm-boy who eventually becomes a knight. The story is nothing new and I can't recall how many times I've read something in a similar vein but unlike a majority of those books, this is well written. The author creates a well structured novel that flows nicely - sentences were not disjointed and the dialogue didn't feel clumsy. However, I did find the prose was a touch too rudimentary for me and it's clear that the book is aimed at more of a younger audience. This is a self-published book and does suffer from the occasional mistake but nothing to annoy you too greatly. This is your standard pauper-to-prince type novel and is accompanied with the usual cliches like how the protagonist tries something new and masters it within the next chapter and how everything seems to fall nicely in place but I wouldn't let that discourage you from a well written book. Its just that I would have liked it if it was more intricate, more complex. This book is perfect for teenagers or parents reading to their children or even for those who want to revisit a good ol' fashioned coming of age story.